After a long and heated fight to save Brooklyn’s Long Island College Hospital from demolition, the site’s future as a medical center has been cemented. But along with the full-service hospital could come two residential towers that are significantly taller than anything in the predominantly-brownstone Cobble Hill neighborhood. Brooklyn Health Partners—a company created to participate in the bidding process for the project—is reportedly planning two 40–50 story towers at the site, one condo and one rental. The scale of these towers was not included in the team’s winning bid. The group’s spokesperson told Crain’s they’re not yet focused on that part of the project. To get this plan approved, the development team is also adopting what Crain‘s called the “Domino approach”—a reference to the winning strategy for the redevelopment of the Domino Sugar Factory. At that site, the developer, Two Trees, was granted zoning changes in exchange for an increase in affordable housing. Plans for the towers at the Long Island College Hospital site call for 20 percent affordable units in the condo tower, and 40 percent in the rental. As the with Domino, this plan requires approval from the de Blasio Administration and City Council. Updated 4/30/2014: Sources tell the Daily News that Brooklyn Health Partners’ plan to maintain a hospital on the Long Island College Hospital site has likely collapsed. 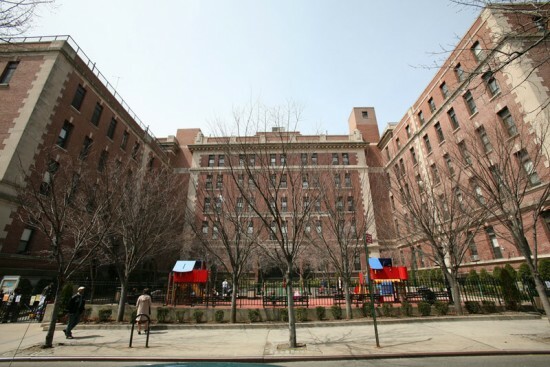 The News reports, “De Blasio, state officials and two powerful healthcare unions all but acknowledged that the winning bidder for the site, a group called Brooklyn Health Partners, has little ability to follow through on its pledge to maintain a hospital there.” A spokesperson for Brooklyn Health Partners rejected this report, saying, “On May 5, BHP will make a $25 million non-refundable payment and show it has the financial means to complete the entire project.” Watch this space.